So you might know that I'm thinking about getting a tattoo. All the cool guys like a lady with ink. Naturally, I'm going about my deliberations in a logical and practical manner. 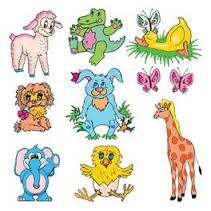 So I went to Toys R Us and bought a package of temporary tattoos of little baby animals. 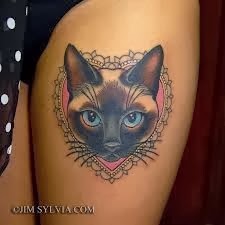 I chose a sleek, classy, and realistic image of a Siamese cat to apply to my arm. In honor of my fat, dumb, silly Siamese kitten. Except that my Toys R Us temporary tattoo looks nothing like that. I'm told it looks like a vaccination scar surrounded by flowers. I think it's gangsta, but apparently I'm in the minority. It's there until it wears off. Personally I like it. I think others of my acquaintance are glad the weather has turned cool so that I'm wearing long sleeves. Still, it's a serious contender for my final, permanent tattoo. Mostly because Precocious Daughter already vetoed the baby orangutan. She's not down with my swag. I think that's a thing. 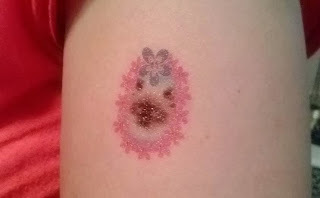 "Vaccination scar surrounded by flowers" just made my day! Thank you.